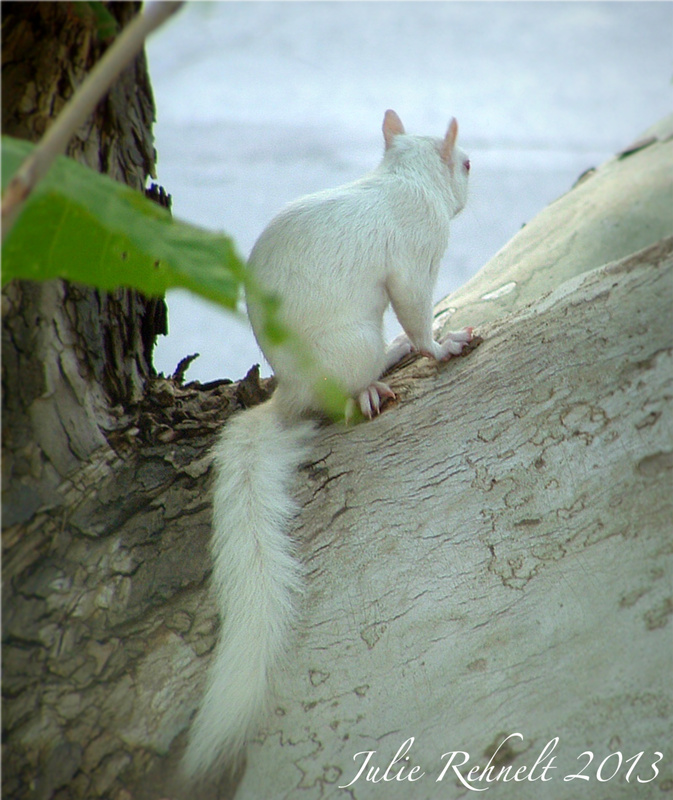 I’ve got a new neighbor… a little albino squirrel has taken up residence in the hollow of the tree outside my bedroom window! 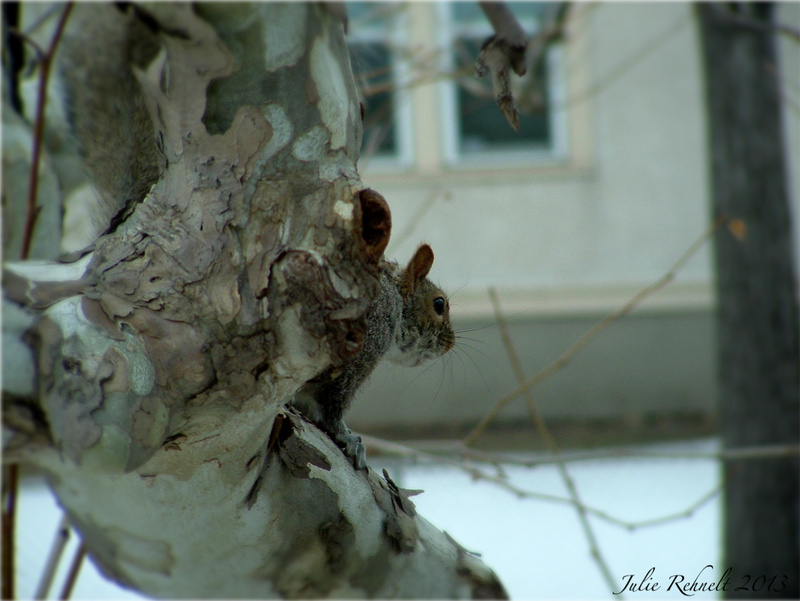 I noticed him during our last snowfall a few days ago. 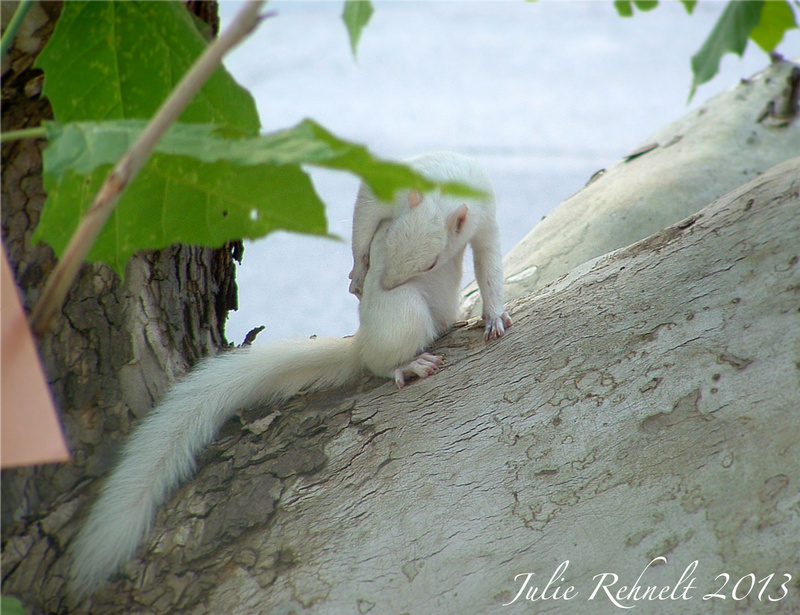 Because it was snowing so hard outside I thought he was a regular squirrel covered with snow at first, but then I realized he was albino! 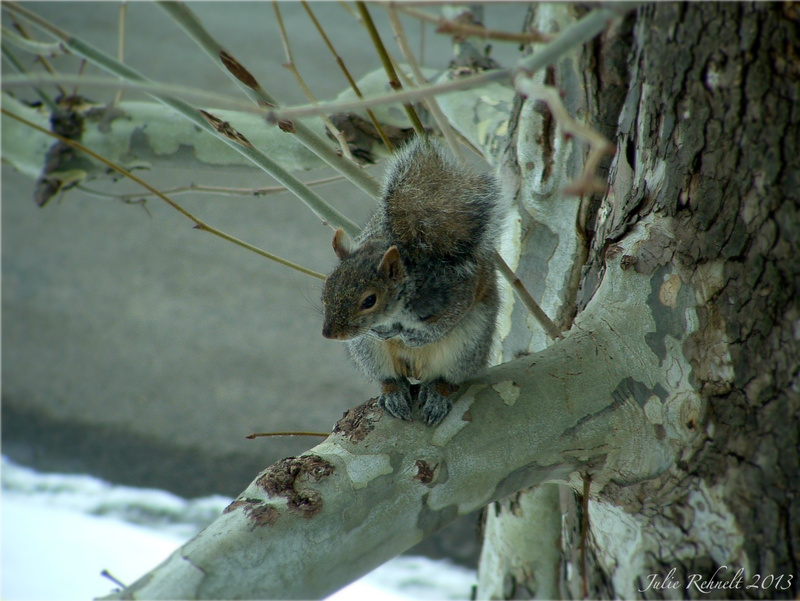 I’ve been having a wonderful time watching him scamper about the tree. He’s a nervous little thing though, always on the move, so getting any decent photographs of him has been a bit of a challenge. 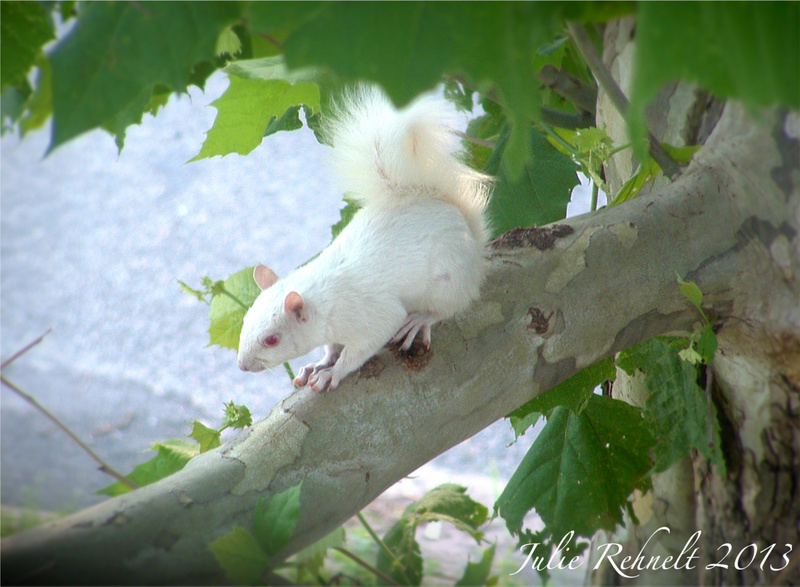 His color is more of a pale grey than white, especially in the lighting of these photos, but I would still consider him albino. 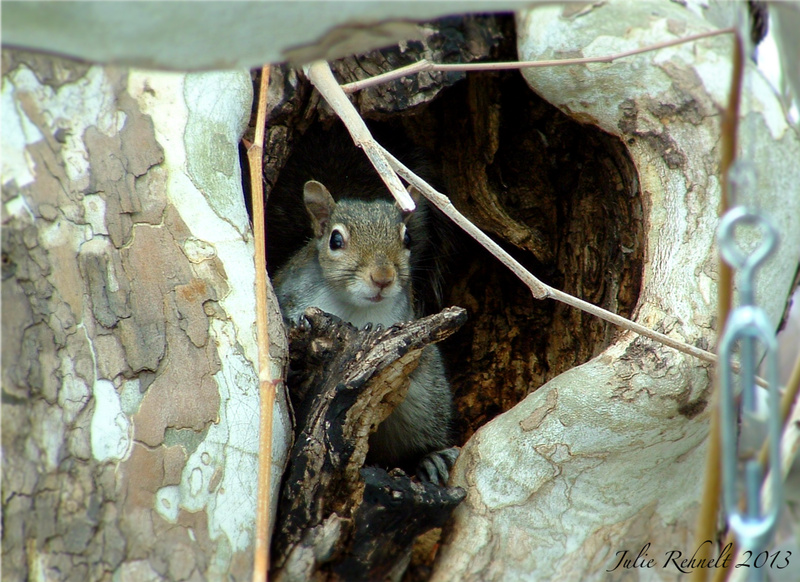 Here is one I caught of him peeking out of the hollow at me. He’s so cute with his little paw up to his chest. 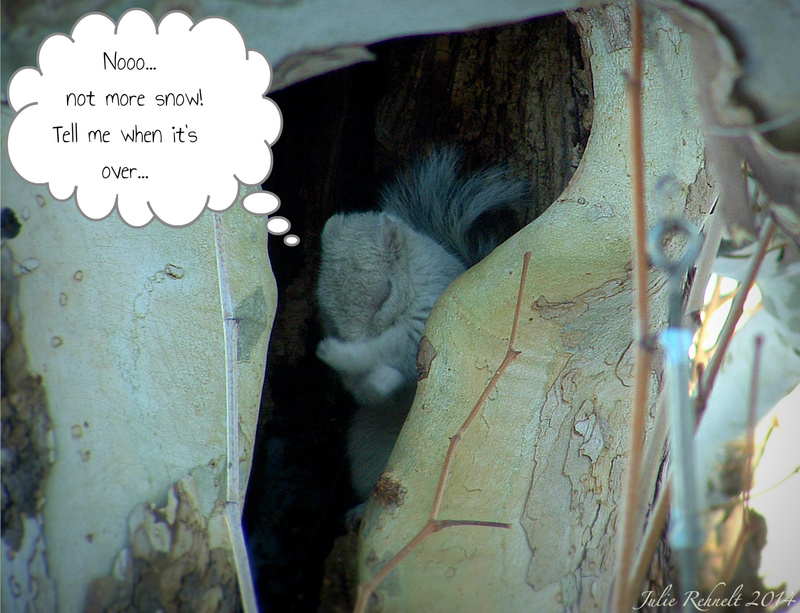 I snapped this one while he was washing up a bit, but he looks like he’s covering his face, so just for fun I captioned it and I think I’m going to send it to my friend who hates winter.. 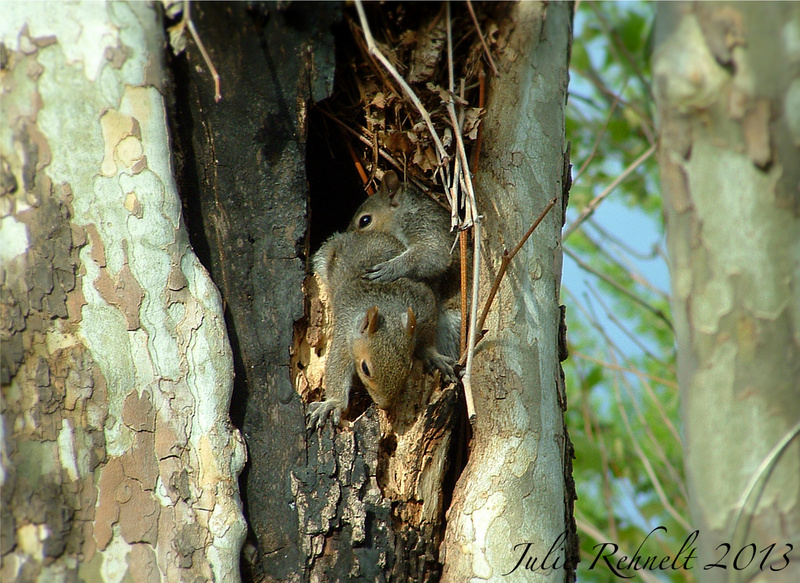 The baby squirrels that I shared about this past June in “Amidst My Branches” have come home for the winter! 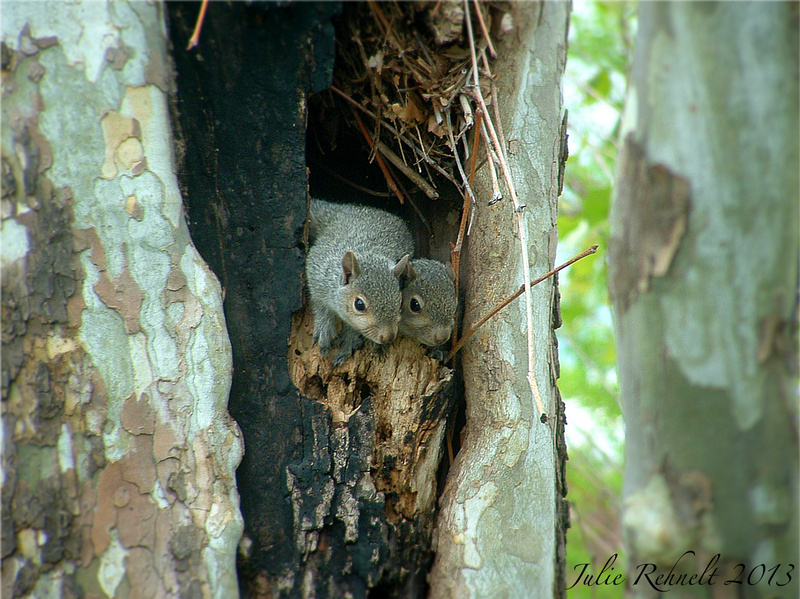 ♥ Of course, I’m not absolutely certain they’re the same exact squirrels I watched grow up in my tree this past spring, but I’d like to think that they are. I wasn’t quite awake yet and it was such a surprise to see it there, that I wasn’t sure it was real at first. 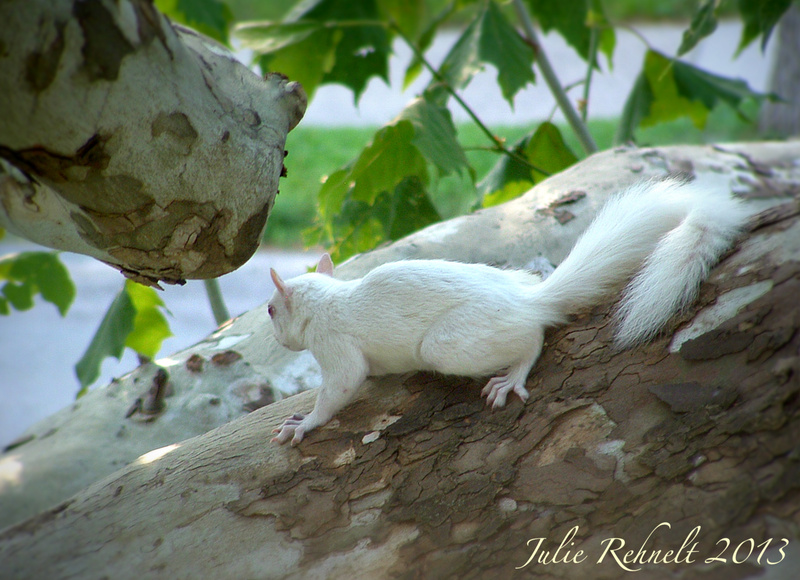 If you’ve been reading my posts for any length of time you know that I already frequently find squirrels amidst my branches, but never an albino one! I’m so glad I had my camera sitting right there so I could snap a couple photos of it. I may go and read up a bit on them, as I think they’re quite uncommon. Have you ever seen one? beneath them a shady place to rest, for when you’re feeling worn. safe and secure they’ll keep you, lifted up on high. 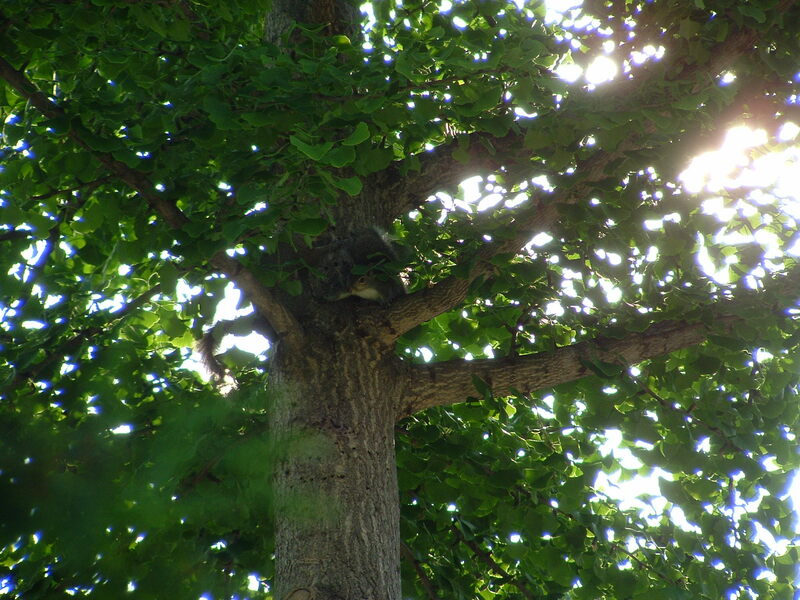 If you look really closely you can just make out the little squirrel that was peering down at me from this tree, along with only the tail of one of its siblings as they were scurrying around on the branches. 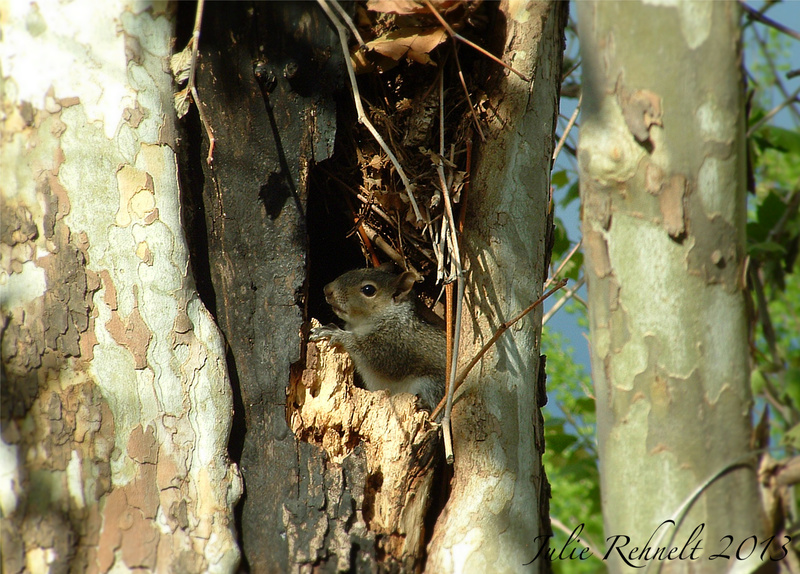 The baby squirrels that I mentioned in my post “To Garden, or to Blog About Garden: That is the Question…” that I saw being carried by their mother into the hollow of my tree, have been an absolute delight to me this spring! 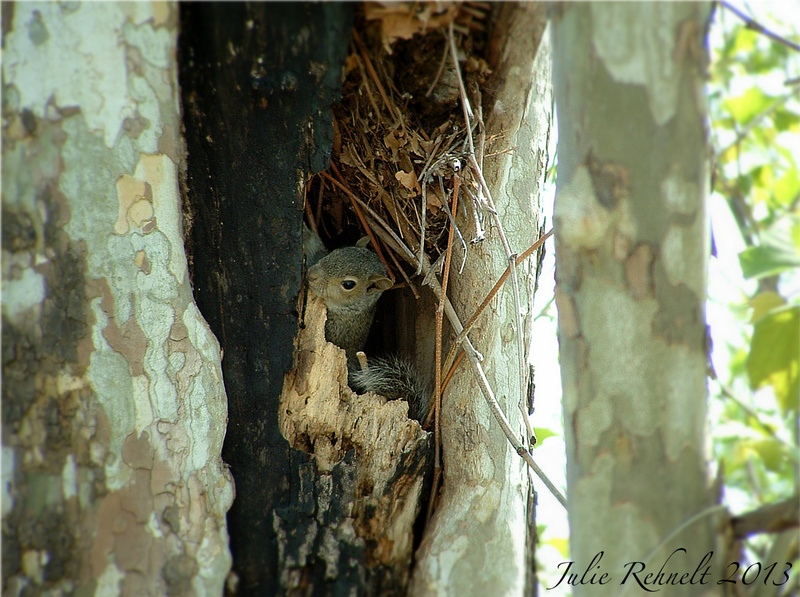 I love little creatures of all sorts and watching these baby squirrels frolicking right outside my bedroom window was such a wonderful experience for me. They were beyond cute, they were downright adorable! But before long they became more and more brave and were soon doing all sorts of interesting (if not frightening) acrobatics. I was afraid for them a few times and even worried that they might fall, but thankfully they never did. 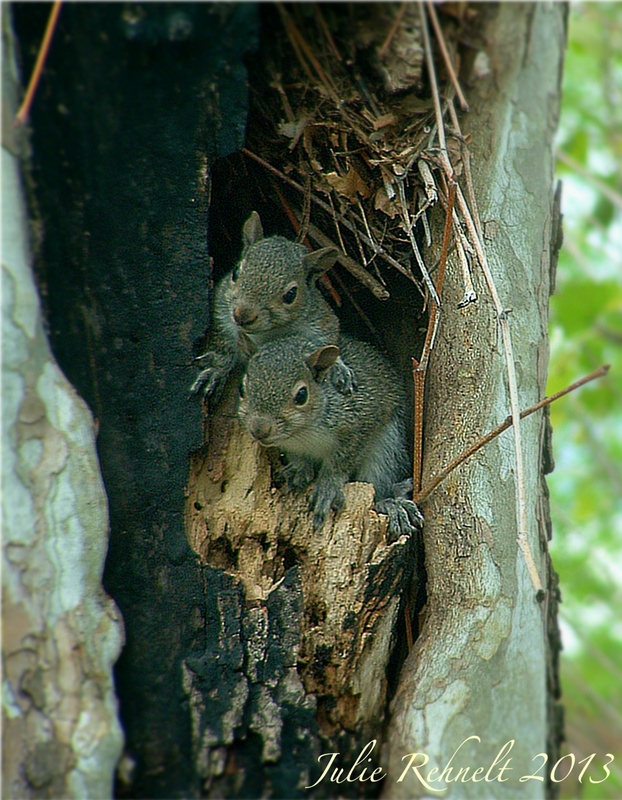 The other two babies were at the very top of the tree, but unfortunately from my vantage point at the window I couldn’t get all four of them in. 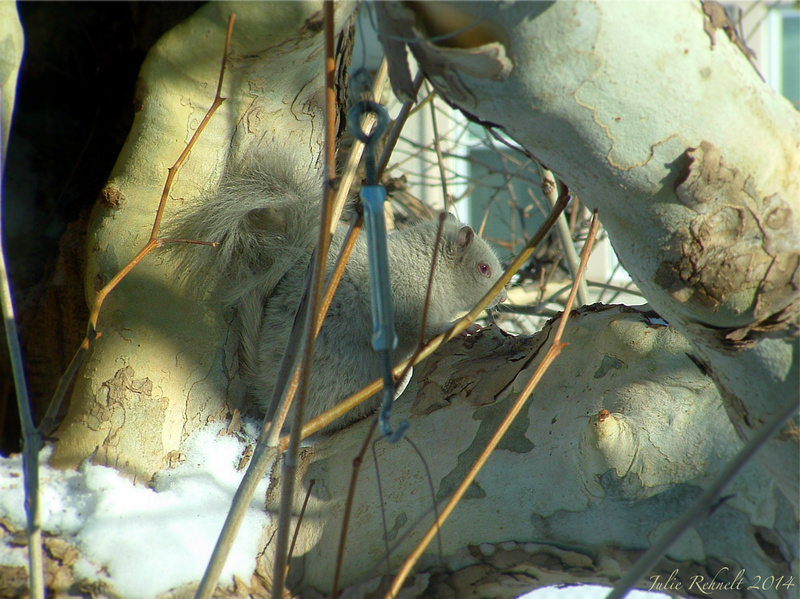 “I spy with my little eye” something gray. Click, caught ya! 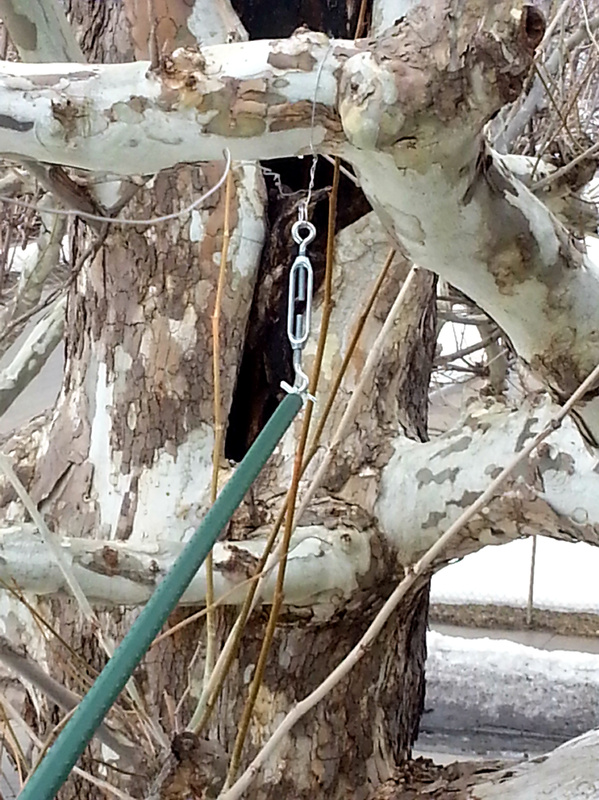 Remember this perfectly innocent looking suet feeder that I mentioned buying in my post “Garden Center Therapy,” and how I wanted to try to figure out a way to hang it in the tree outside my 2nd story bedroom window? 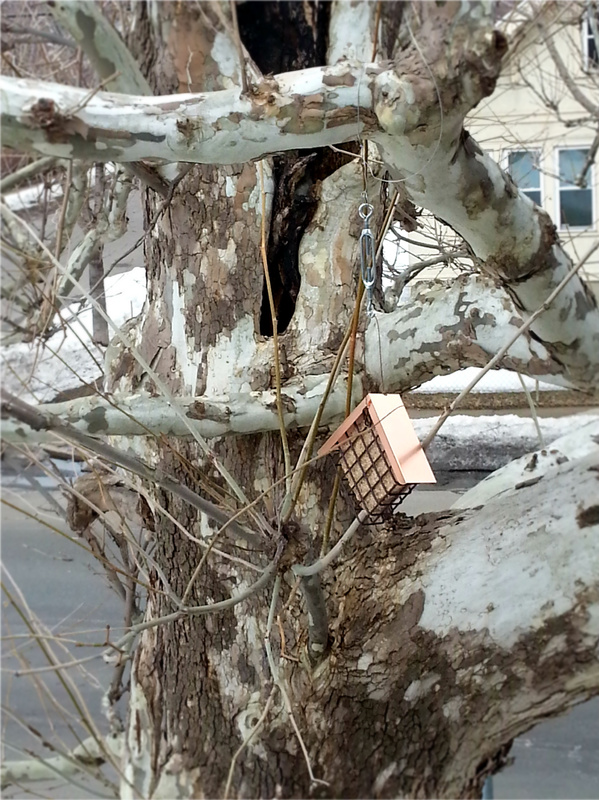 After she got off work we ran some regular errands and then stopped at The Home Depot to pick up a few materials to help us concoct some sort of MacGyver type of contraption that would enable me to hang my suet feeder in the tree outside my bedroom window without having to use a ladder. Not only am I not a huge fan of ladders in general, but my dad’s ladder is hidden within the far reaches of the garage and will be inaccessible for quite some time. 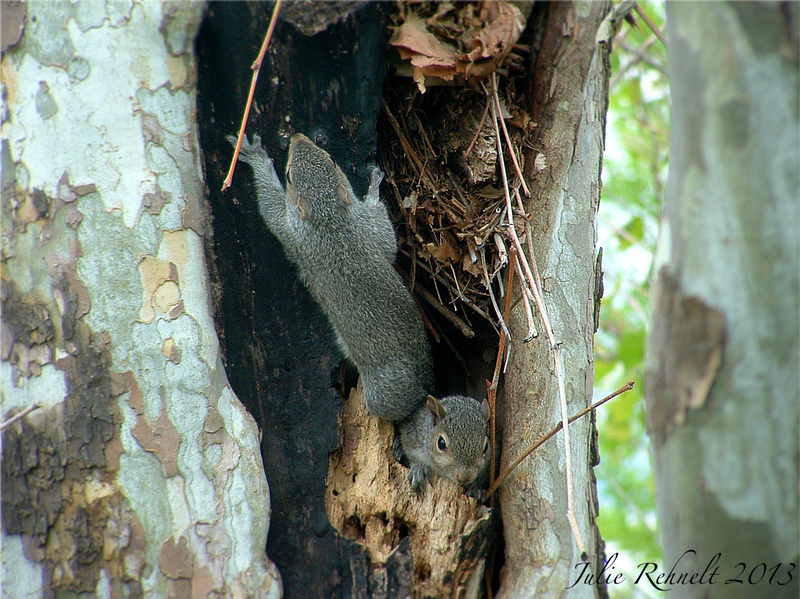 And I want to put my feeder up now. Also, going forward I want to be able to do it from my window and not have to get on a ladder every time I need to refill the feeder. As far as accessing the feeder once it’s in place, I figured all I would really need is a pole with a hook on the end of it that would be long enough to reach it with. My sis was thinking about some sort of extendable type of pole, but those felt way too heavy for me with my weak girlie hands, I would need something of much lighter weight. Well, because I’m in gardening mode right now, what came to mind were those plastic green garden stakes that you can get to prop up plants with. We found a 6 foot one, screwed a hook onto one end of it, and voila! So on that part I was good to go. 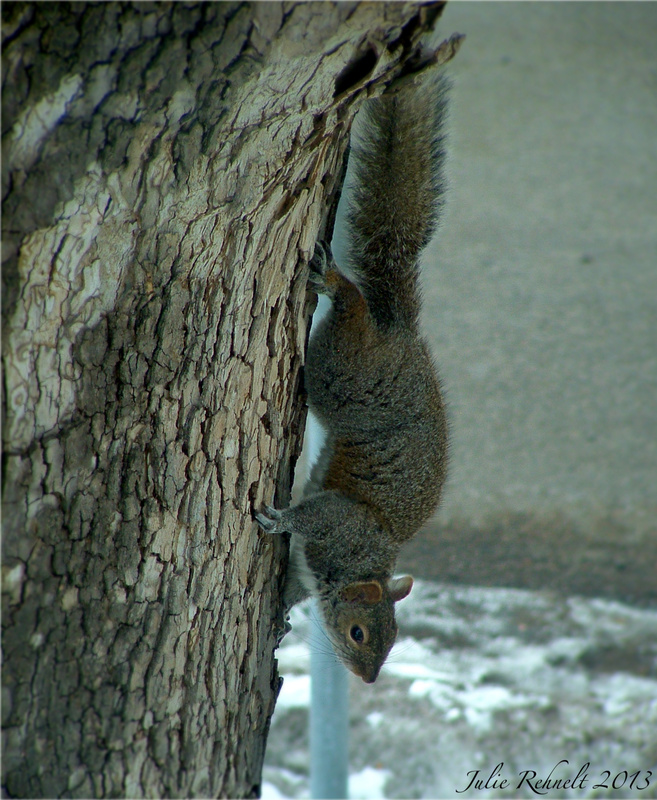 But how to figure out going about putting something onto the tree for the feeder to hang from without the use of a ladder… now that was an entirely different matter. After way too much brain pained deliberation (relieving you here from having to read all the gory details of how mine and my sis’ brains formulate solutions), we ended up leaving the store with just some coated wire and a hook/eye turnbuckle thingy. 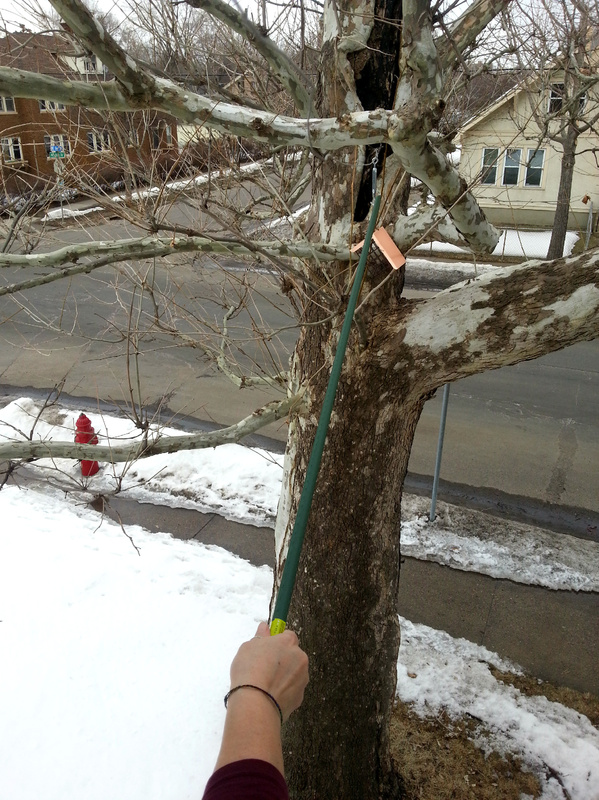 As to how we would actually use those two things and go about rigging something up on the tree from my window… we figured we’d just wing it. 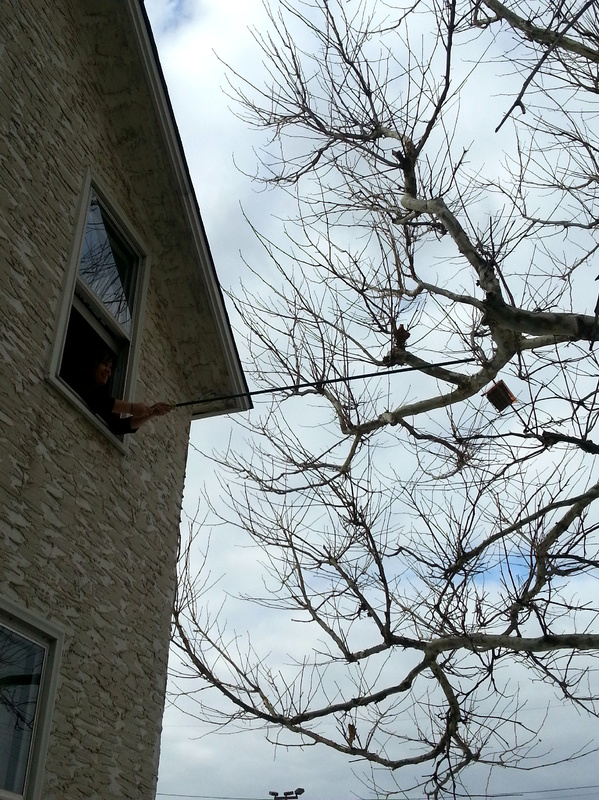 When we got to the house and contemplated a bit further, I got to thinking that maybe we could just tie the eye end of the turnbuckle to the wire and then toss it out the window and try and get it over the branch, then grab it with my pole/hook thingy and somehow try to tie it off. Easier said than done. Trying to tie a knot that is 6 feet away while using a skinny pole with a small hook on the end of it is a lot harder to do than you’d think it would be. And it didn’t help that the turnbuckle thingy kept spinning about. But apparently, even though I may not have much strength in these girlie hands of mine, I clearly possess some finesse in my maneuvering abilities with them because I did it! My sister took this photo of me with her phone while I was working my magic at knot tying from 6 feet away. You may not be able to see it very well, but the other end of the wire is tied off to the handle on the inside of the window. Earlier, my sis was holding that other end of the wire and we looked like a couple of puppeteers working at it together hah! But we really make an excellent team. Then it was time to test and see if my skills extended to the ability of being able to hang the actual feeder onto my newly installed contraption. So down I went to fetch it. 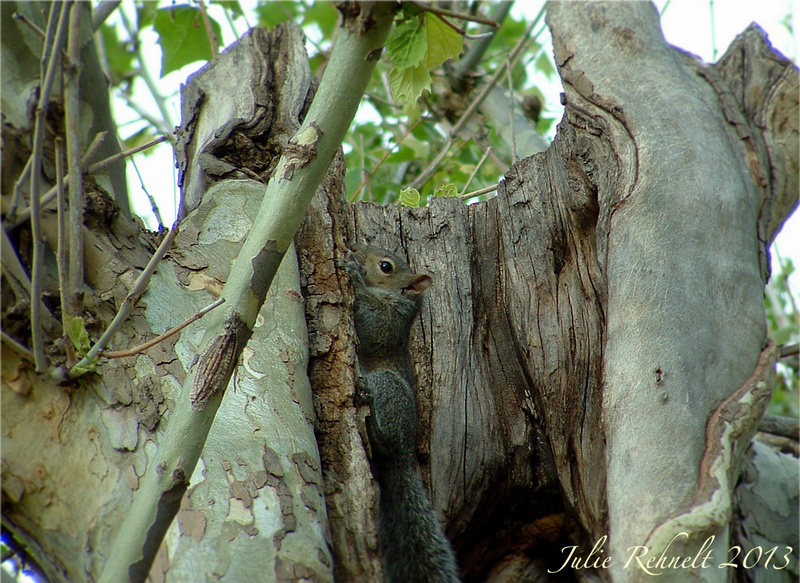 My little squirrel peeking out from his hole! Omygosh look how cuuuute!!! 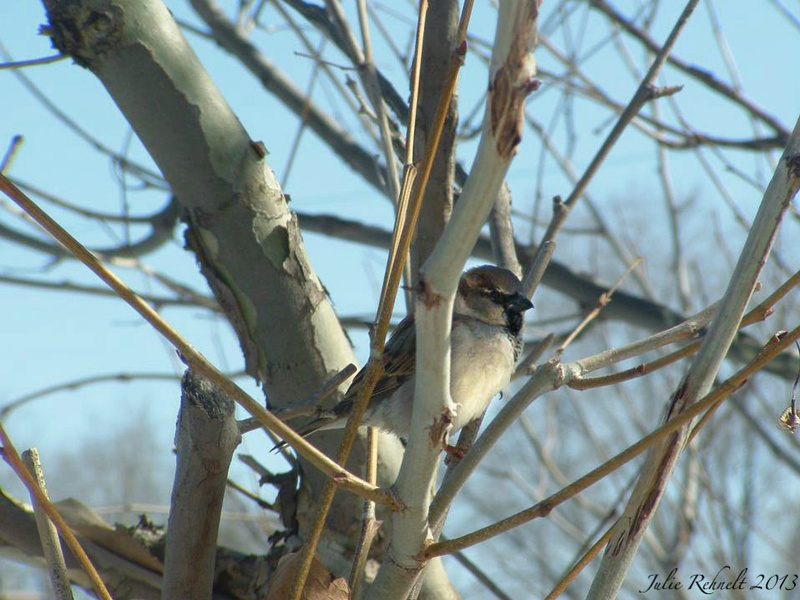 Since putting it up, I haven’t noticed any of my little feathered friends dining at my new feeder yet. 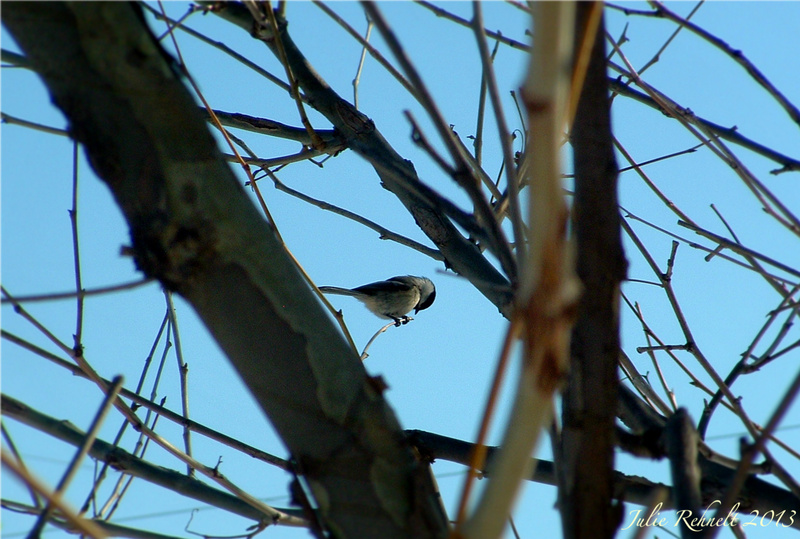 But I’m sure I will eventually, as I have quite a few that frequent my branches from time to time. 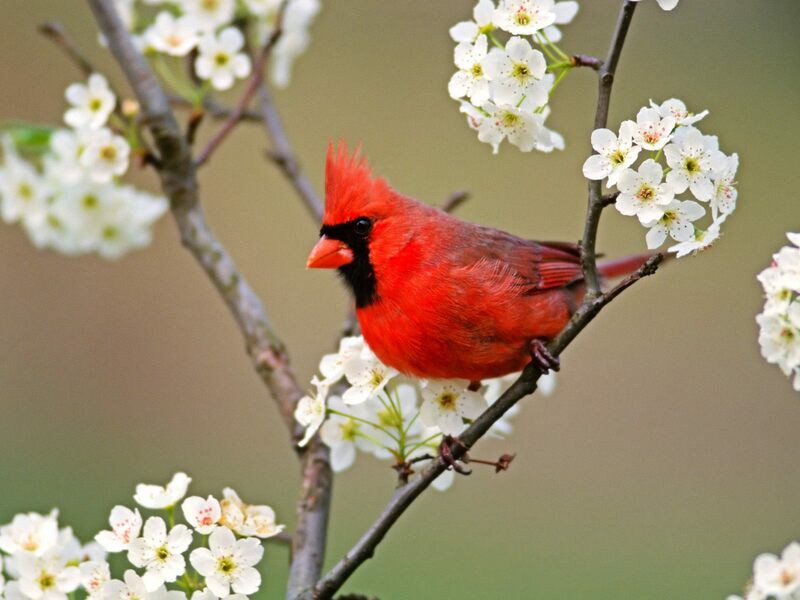 Although, Cardinals don’t typically eat from suet type feeders, so I don’t expect to see them eating at mine. 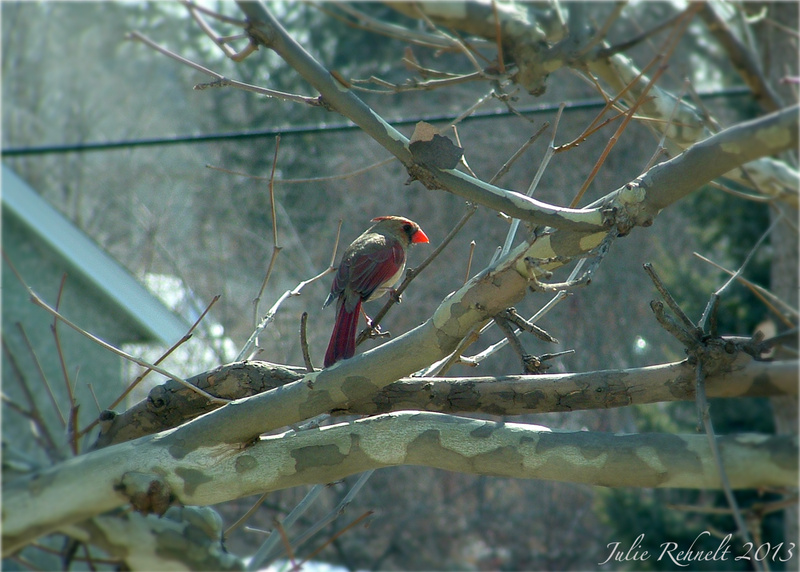 But I was really excited to see this bright pretty gal stop by and to catch a photo of her! 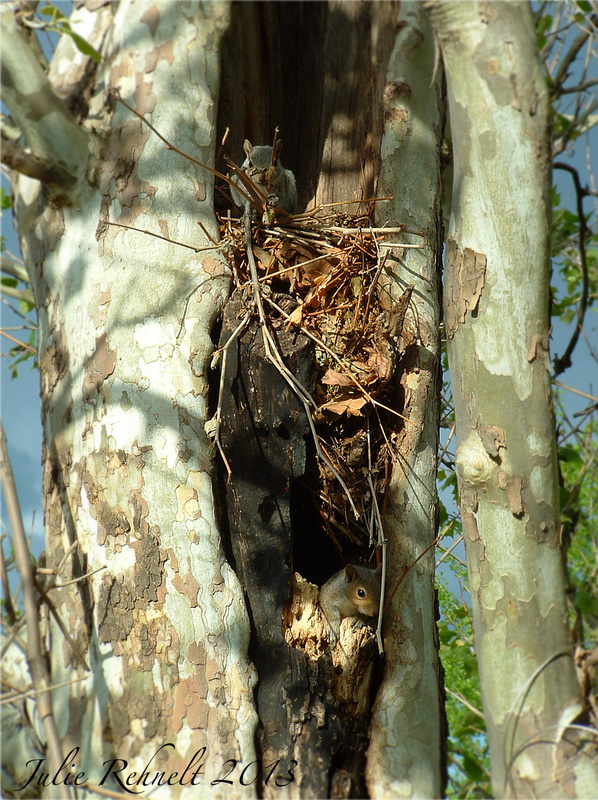 Maybe she’ll decide to build her nest among my branches, what an absolute delight that would be! 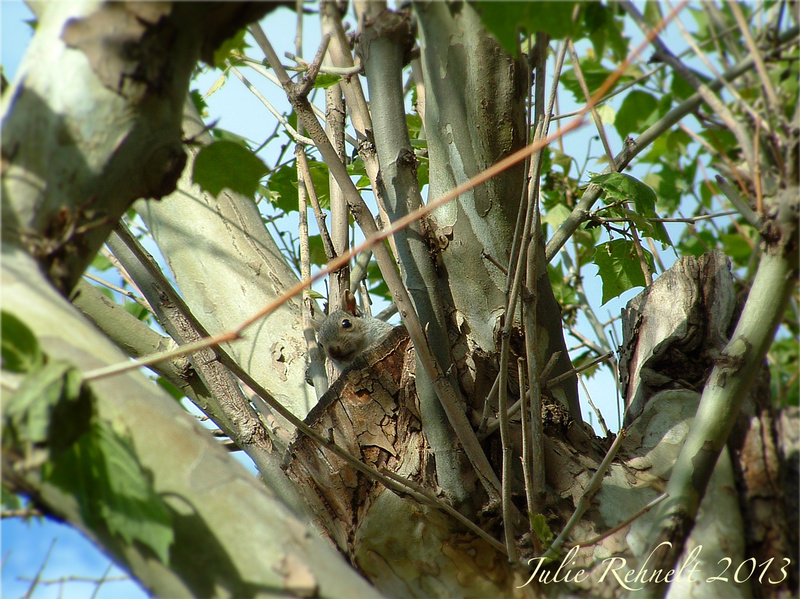 I discovered a new little squirrel friend frolicking in the branches of the tree outside my bedroom window this morning. 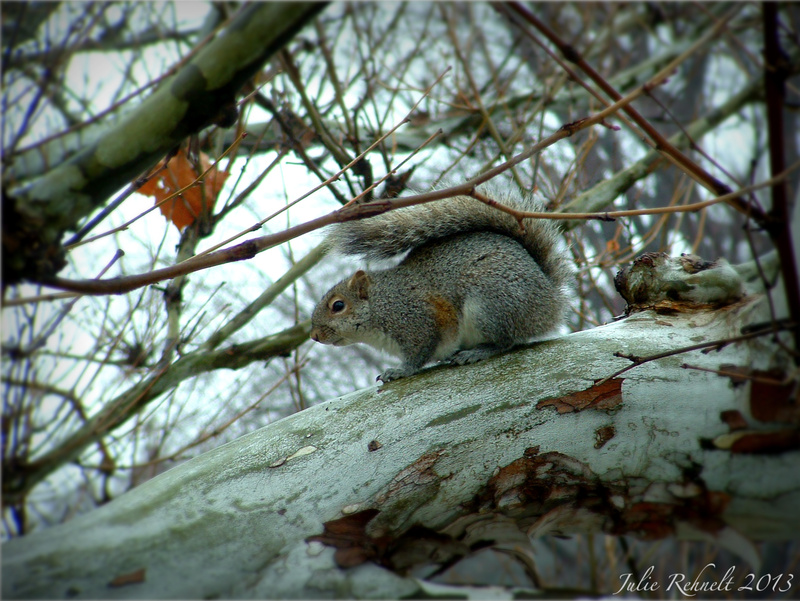 And I had a wonderful time watching him and trying to photograph him as he scampered about the branches. 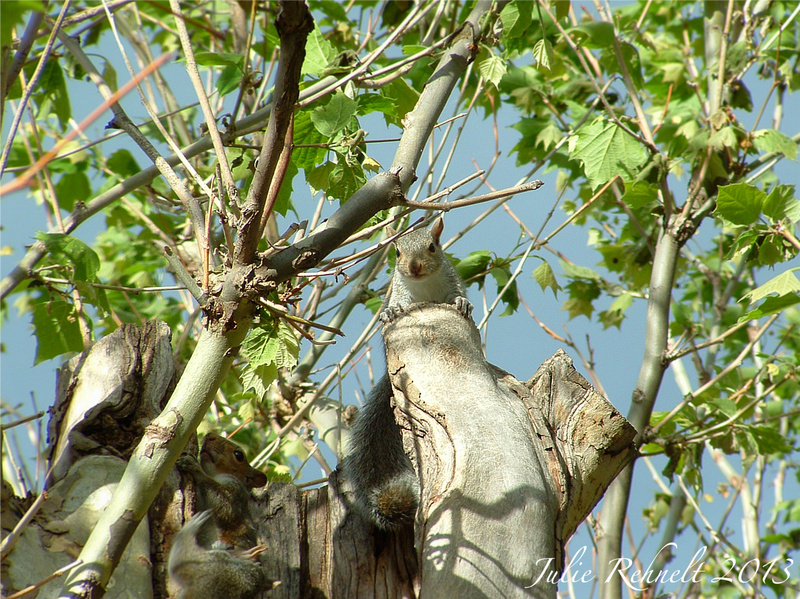 He was being a bit camera shy and elusive at first, when I caught this little “on the look-out” shot of him. 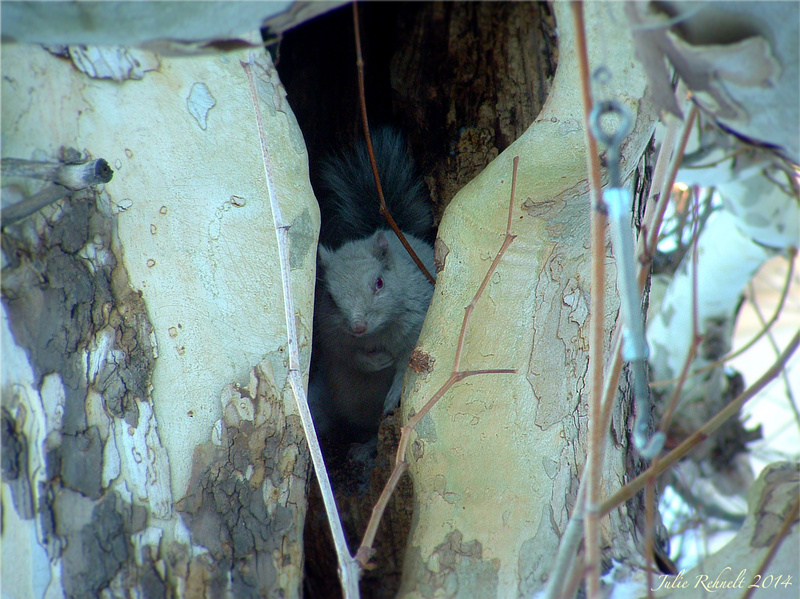 He blends in well with the tree here, and did a pretty good job at trying to be incognito. Here I caught him as he was sitting up on his hind legs with his front ones tucked against his chest. I like how he has his head tilted a bit off to the side, shyly looking my direction with his one eye. So sweet. This is my favorite one that I took of him, snapped just before he scurried away. In the mornings I like to sit and look out the windows of my room while drinking my coffee. 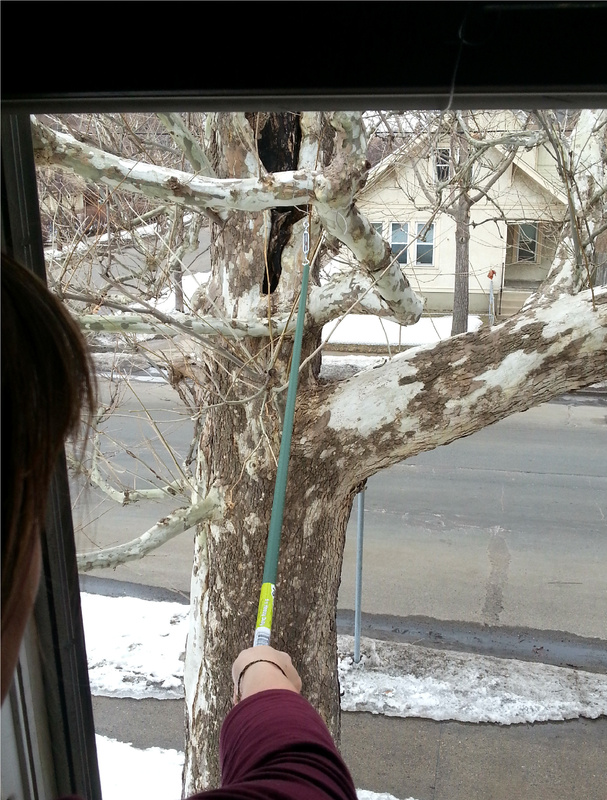 I have a huge Sycamore tree right outside that my Grandpa planted way back in the 1940’s, and its branches basically cover the span of all three of my bedroom windows. 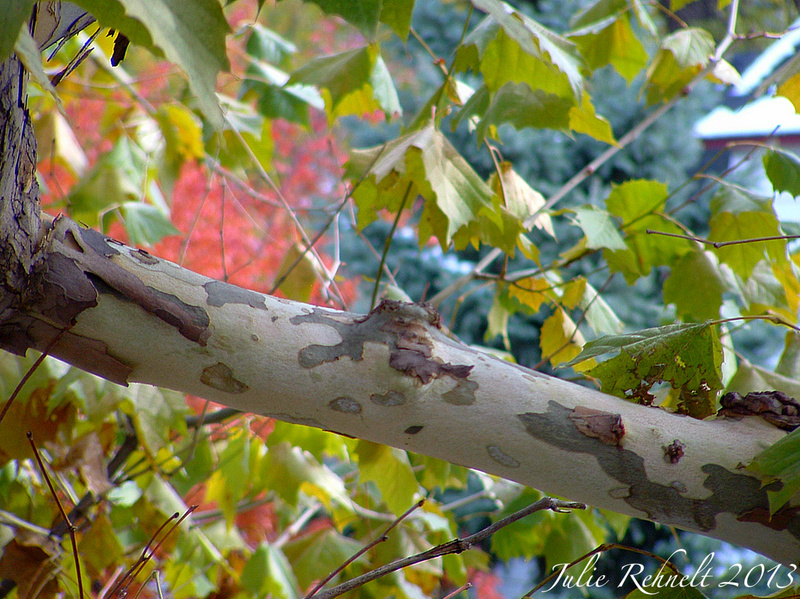 It’s an odd shaped, but interesting looking tree, they are not commonly grown here in Minnesota so I feel special to have one. 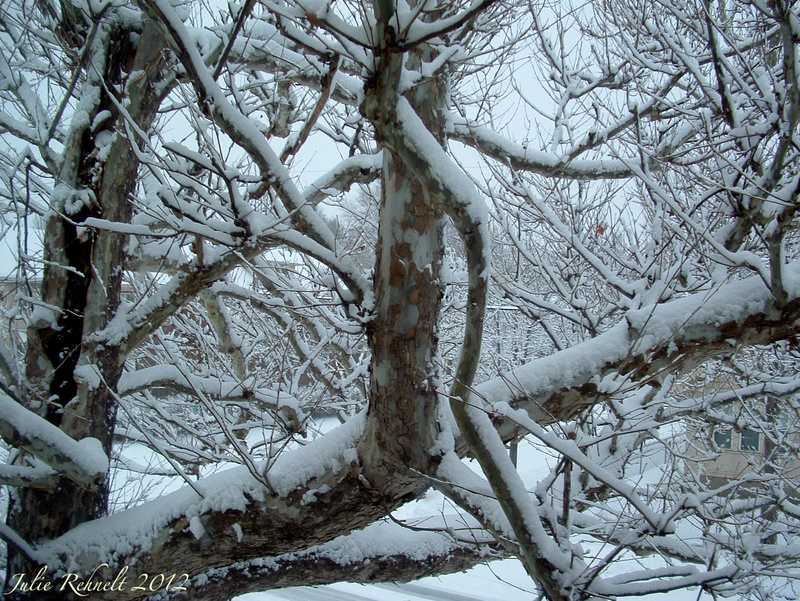 The branches are barren right now in the winter, well except for when they are covered with snow, 😉 but when I moved back home here this past fall its branches were filled with gigantic leaves that filtered the light in through my windows so beautifully. 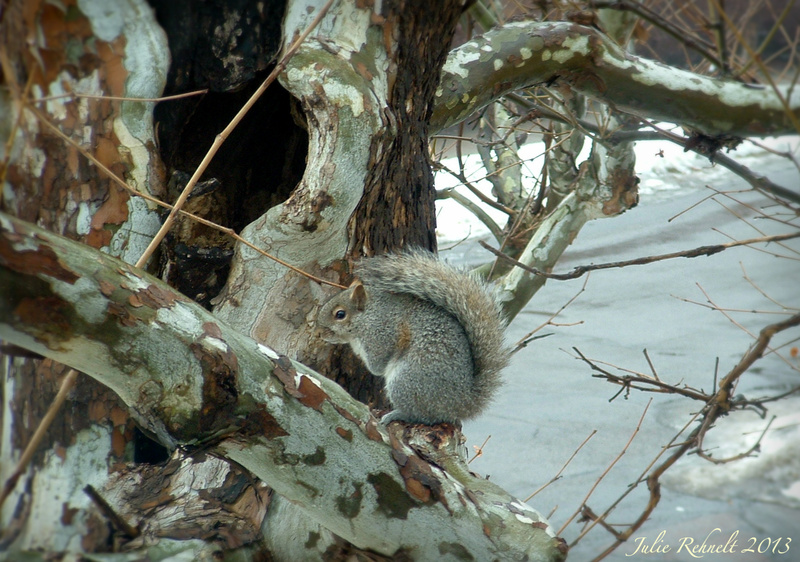 Aside from the tree itself, one of the other things I really enjoy about it is watching the little creatures that sometimes occupy its branches. 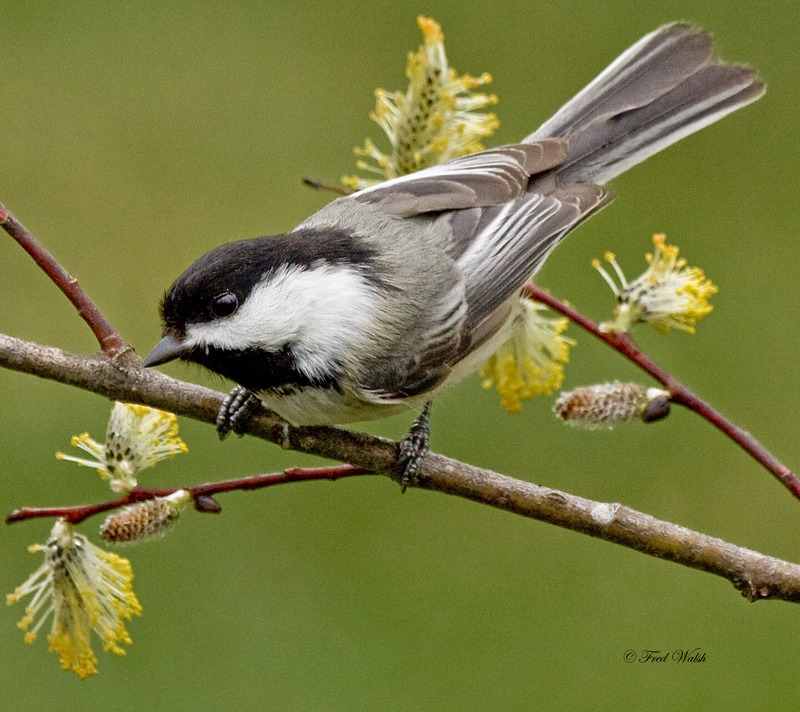 Two of my favorite species of birds, the Cardinal and the Chickadee often come to visit and it’s always such a delight to watch them flit about. I wish they’d sit still long enough for me to snap a picture of them, but they are busy little things and always on a mission. However, I did manage to catch this shot of a huge crow cawing the other day… Seriously, the size of this thing was massive! 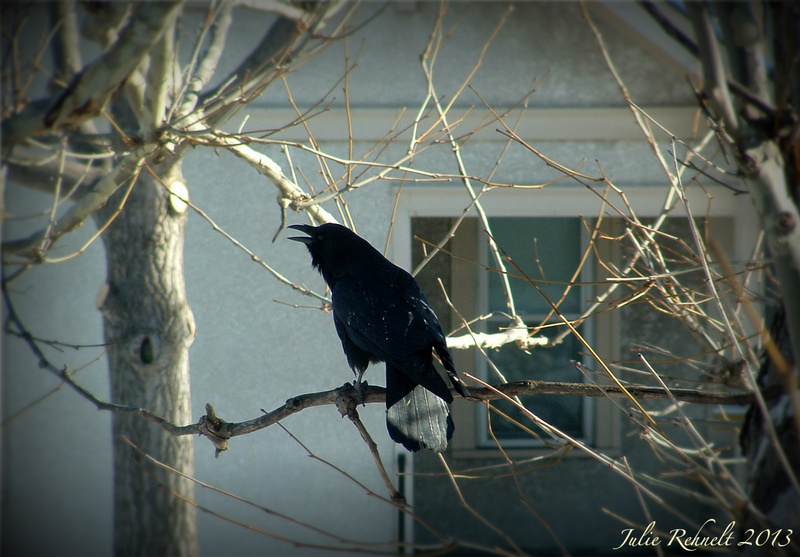 Crows are not a favorite bird of mine, but they are really cool and also quite intelligent. My daughter says she is going to try “befriending” one this summer, but not if I have anything to say about that, I don’t need crows coming around bothering my vegetable garden this summer. 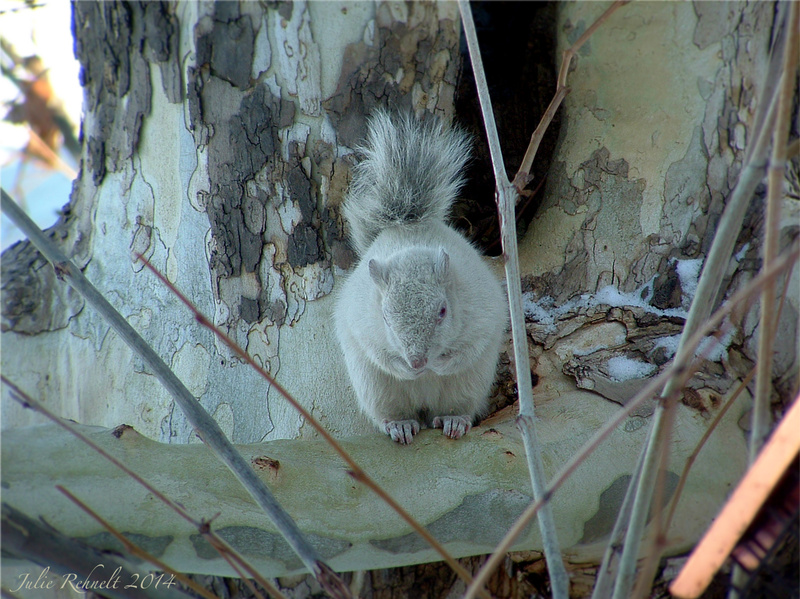 I had enough trouble with squirrels! 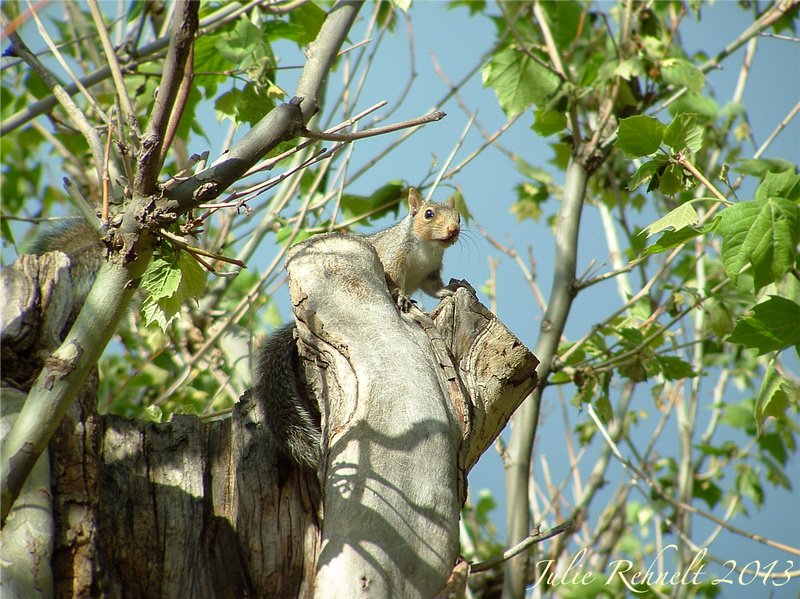 I recommend reading both of those posts to give you some background on what I’m going to say next here because the funny thing is… I grew to become quite fond of that naughty little squirrel. 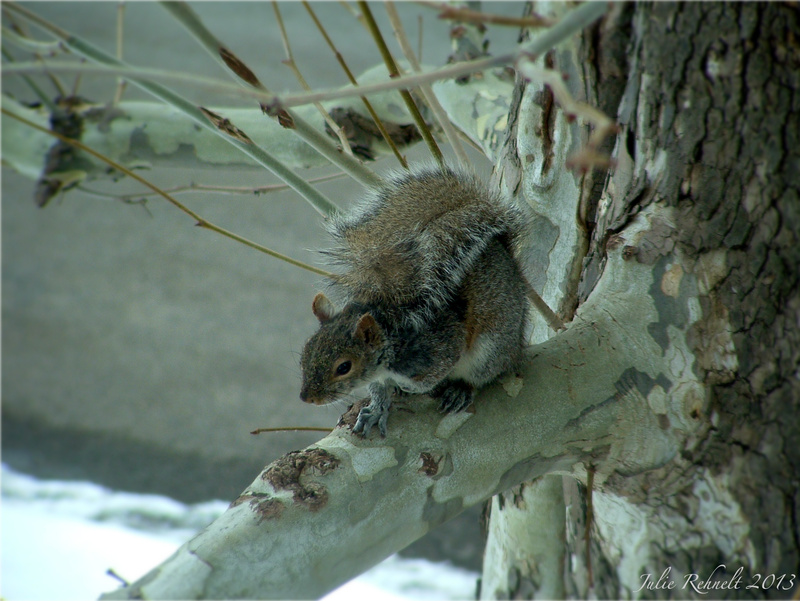 Seems impossible, I know, after joking around about ways in which to dispose of the little thief and sharing about my recurring nightmares about squirrels, but once I put my garden to bed for the winter, and began spending my mornings in front of my bedroom windows with my coffee, I became fondly attached to him in watching him prepare his home for the winter in the trunk of my tree. 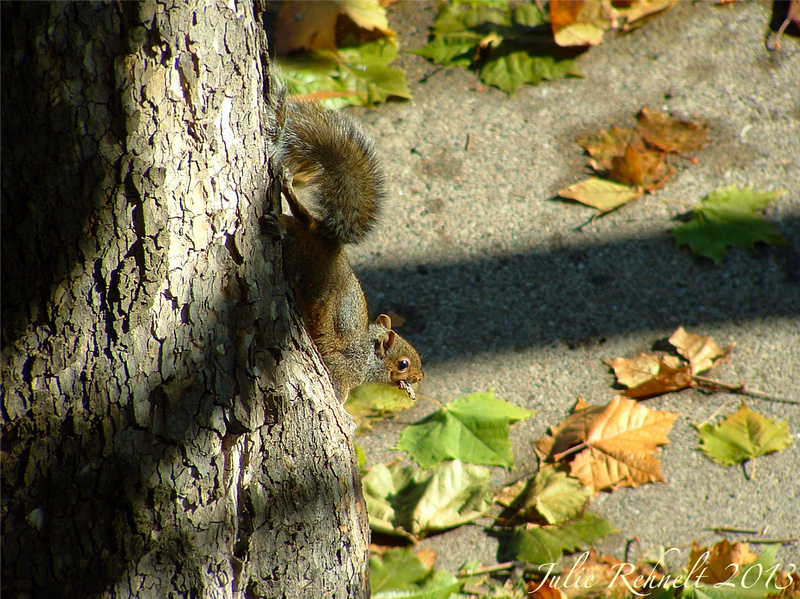 Scurrying among the branches, gathering those giant Sycamore leaves in his tiny little paws, and rushing off to stuff them into his hole = sooo cute! 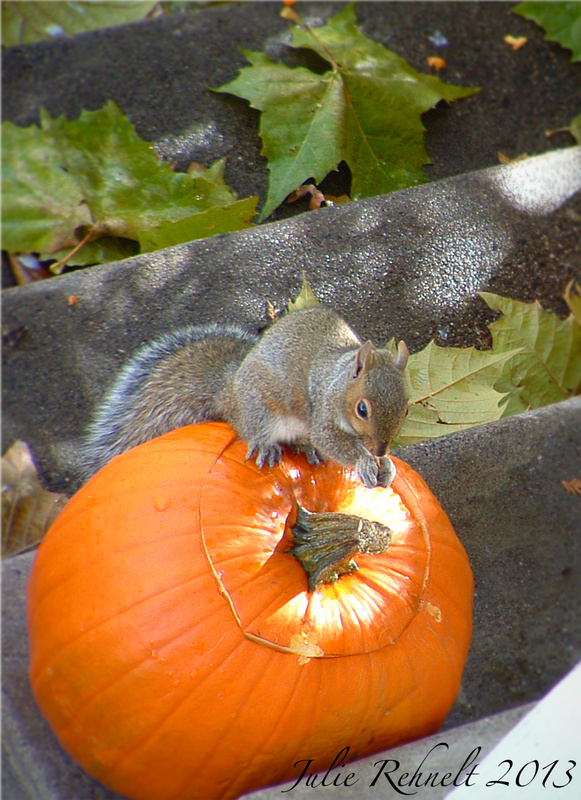 Those grubby, thieving, little paws that once made me so angry became so adorable and so much fun to watch. You know, I really do love all little creatures, even the ones that make me mad. 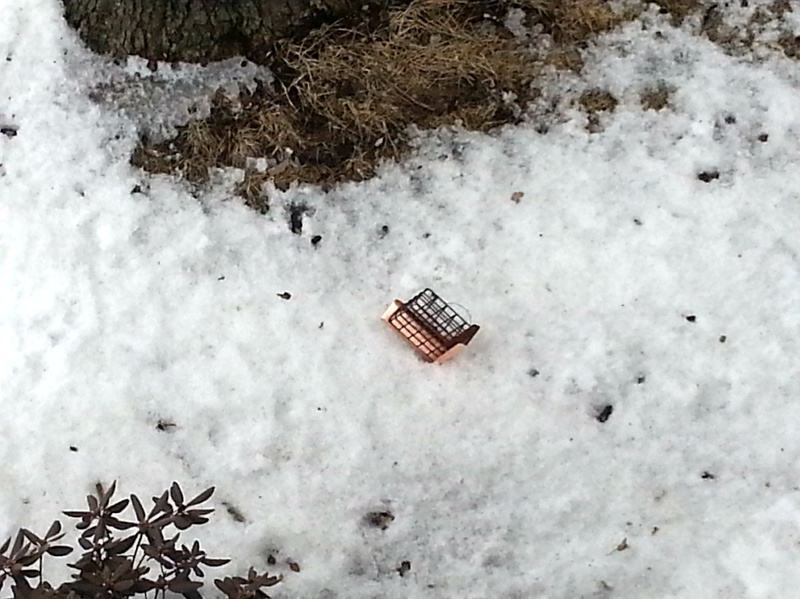 So now, after many days since Little Thief’s untimely death, I think someone new is considering moving in because look what I just saw… Mr. Opportunity, no doubt. And that is as he shall now be named.